, in D.C. I'm trying to tick things off my bucket list, some new places to try and some old spots that I know I will miss a lot, this is definitely on my list. Their menu is always delicious and every item on it bursting with flavors, we ended up trying several different dishes and by the end of the meal we struggled to with our desserts (honestly, we could have skipped it but they sounded and were incredible). Strangely enough, we never ordered any samosas which then led me to remedy the situation with these guys! I did something very different this time, I infused the pastry dough with fresh rosemary (though dried will work as well here) and also used coconut oil to create the dough's flakiness. The filling for this breakfast-themed pastry includes a mix of sweet potatoes, leeks, spinach, boiled eggs and a little more rosemary that spiced to create a delicious flavorful mix. There are step-by-step photographs that M took while I prepared the pastries to cook which hopefully make things easier. This is also the way, I prefer to cook my samosas, I don't like to deep fry but simply baking them takes away from the texture of the pastry. So, I do a two-step cooking process where I lightly pan-sear the samosas on each side in a little oil and then bake them till they are cooked. You can do what I do, prepare these for brunch and/or save the rest and reheat them in the mornings. 1. Heat the oil in a large saucepan on medium-high for about 30-40 seconds. As soon as the oil gets hot, add the rosemary and stir for 10 seconds. 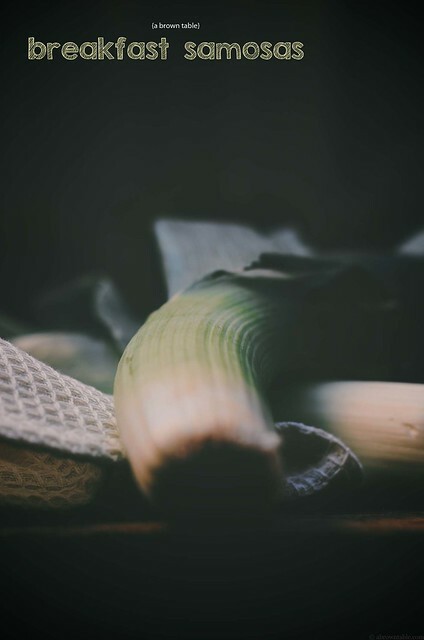 Stir in the leeks and sauté for 2 minutes. 2. Add the sweet potatoes and coat them with the oil. Cook for another 5 minutes, until the sweet potatoes are just tender. Add the spinach leaves along with the chili and salt, stir and continue to cook until the sweet potatoes are completely cooked. This will take about 4-5 minutes. If the spinach releases a large amount of water, continue to cook until the liquid evaporates. Fold in the eggs and the garam masala. Remove from stove and keep the filling aside, until ready to use. 1. Add all the ingredients from the flour to the salt in a food processor. Pulse a 2-3 times for 5 second intervals to evenly mix all the ingredients. 2. Add the coconut oil to the dry ingredients and pulse for 10 seconds. Sprinkle the 6 tablespoons of water over the flour and pulse the ingredients until they combine to form a ball dough. You may need to add more water to bring the ingredients together. Once the dough is formed, remove from the processor and wrap with cling film. Allow to rest for at least 60 minutes until ready to use. See the step-by-step photographs photographs above (from top left to right and then bottom left to right). 1. Dust a clean pastry board or smooth kitchen surface with a little flour. Unwrap the dough and divide the dough into 14 equal parts. Mold each part into a ball, cover the balls with a damp cloth to prevent them from drying out while you are preparing the pastries. 2. Take one ball of dough and roll it out into a 5-6 inch circle, dusting with a little flour to prevent sticking. The edges of the circle do not need to be perfect as you will fold them over. 3. Divide the circle into two semicircles with a sharp knife or pastry cutter. 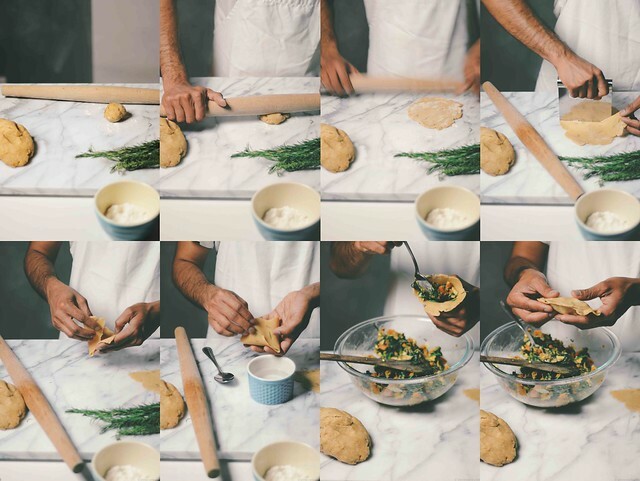 Take one semicircle of the pastry in your hand, using your fingers bring the straight ends of the semicircle together and brush the straight edges with a little water and gently press to seal to form a cone. 4. Fill the cone with a generous tablespoon of the sweet potato filling prepared earlier. 5. Brush the open ends of the cone with water and then press gently to seal the mouth. Brush this sealed edge with a little water and then fold this edge once over itself to form a tight seal. 6. Prepare the rest of the samosas similarly and keep aside covered with a damp cloth until ready to cook. 1. Center a wire rack in the middle of the oven and preheat to 350F. Line two baking sheets with parchment paper. 2. In a medium sized non-stick pan, heat two tablespoons of the oil on medium high. As soon as the oil is hot add 3 samosas and lightly cook them on each side until they are lightly seared and become lightly golden brown. You may need to add a little more oil for searing the other side. Transfer the samosas to the prepared baking sheets. 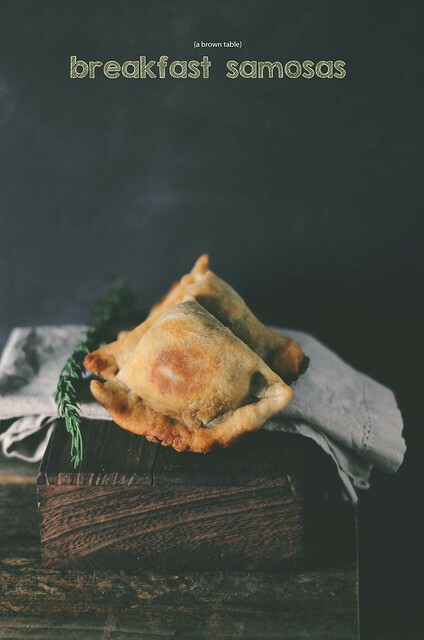 Bake 7 samosas at a time for about 20 minutes or until they are completely golden brown. Repeat this for the rest of the samosas. 3. Serve hot with ketchup or sweet tamarind chutney. Store in airtight container in the refrigerator for up to a week. You can reheat the samosas in a microwave or toaster oven before eating. In "Appetizer", "Breakfast", "Indian", "Vegetarian", "baked", "pan seared", "pastry", "samosas"
Thank you so much for all your kind words and support. To be honest, things have definitely become a little crazy here but we're trying to tackle the madness together and that's what makes it fun! I've chalked out my bucket list of places I've wanted to eat at or want to eat at again, sights I want to see; but how much of this I will get to accomplish, I'm not sure but I'm going to give this my best shot. 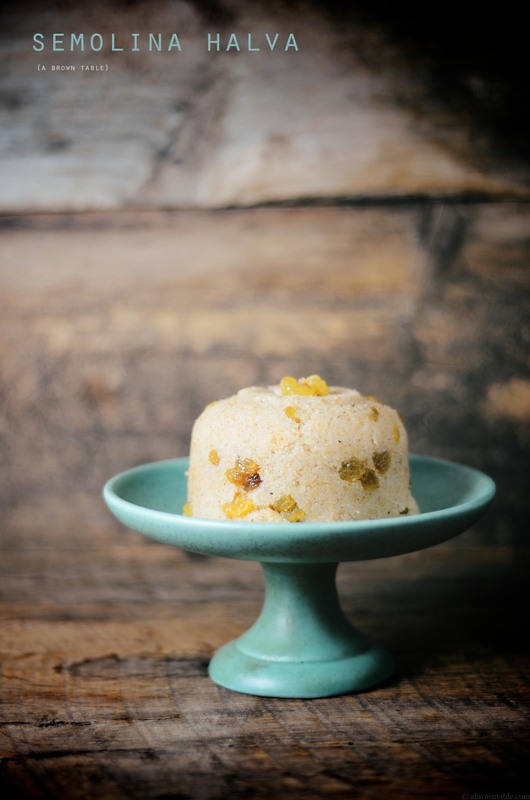 Have you ever tried a semolina halva? 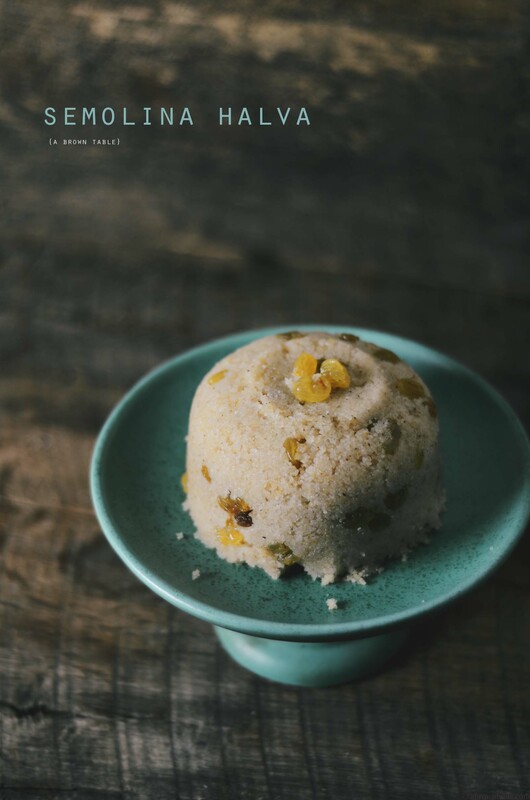 It's probably my favorite halva because of its simplicity and the toasted aroma of semolina can be pretty delicious and comforting. This halva is wickedly two-faced and satisfying, you can eat it for breakfast or serve it as dessert, either way it never disappoints! 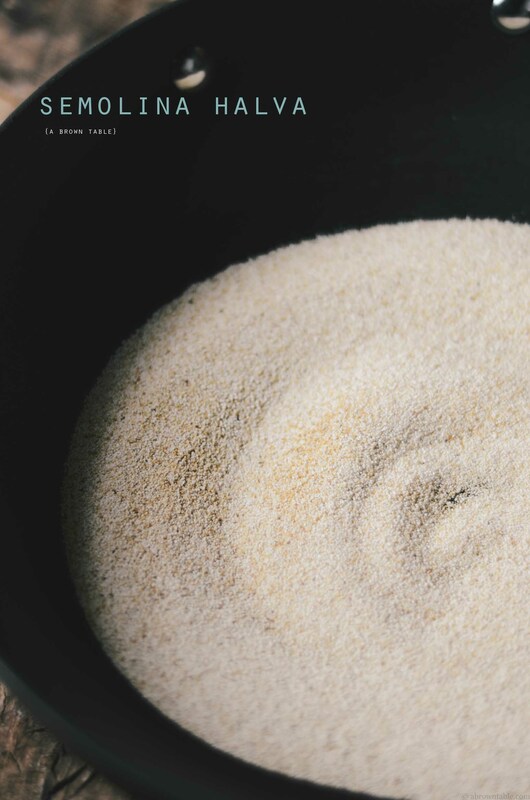 Semolina is the tinier cousin of bulgur and it resembles a fine sand. You need to lightly toast the semolina but be careful while doing this as it can burn fast, the photograph below shows how deep I let it brown and should give you a rough idea of what the semolina must look like. You can also use ghee instead of coconut oil (stick to the same amounts) in this recipe. 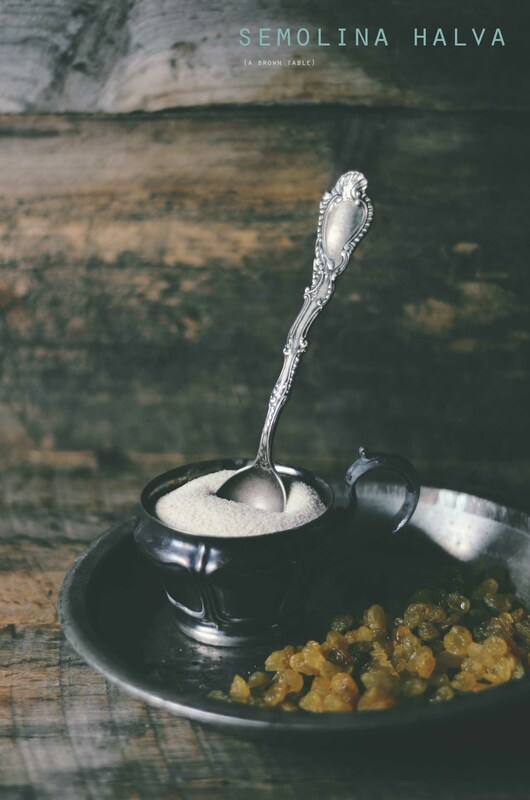 The semolina itself is lightly sweetened but the golden raisins impart a pop of sweetness with every bite you take. The rose water is completely optional and I don't like nuts with this halva so I didn't add any but feel free to add a few mixed nuts with the raisins if you prefer to. Here are some of my fellow blogger peeps that made me very hungry this week! What's for Breakfast, Today? 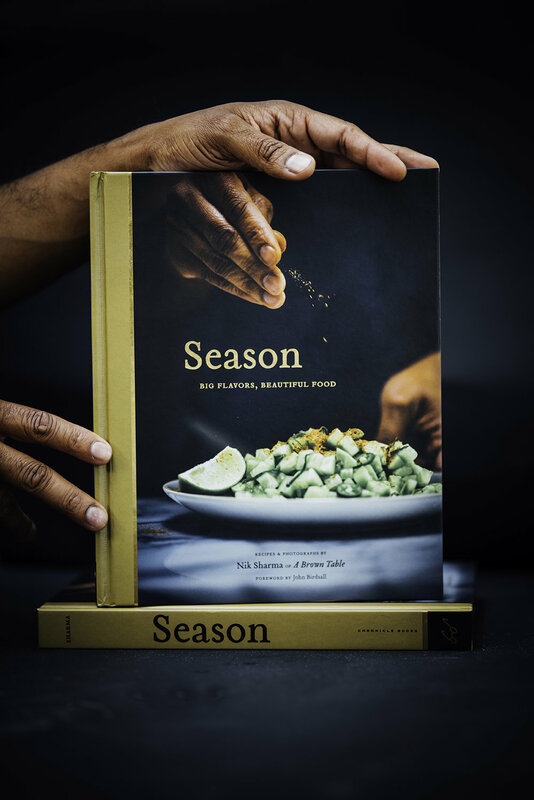 by Marta is a spectacular collection of food and travel photographs that if you haven't come across already, you need to check it out! Her work is inspiring and tasty! Molly of My Name is Yeh whipped up a batch of pretzel shortbread cookies and then drizzled them with chocolate. I want to eat each and every cookie she baked. I'm on a breakfast kick these days and Kelly of The Gouda Life is responsible for this, reason being her blackberry sour cream muffins. I'm also super thankful to the wonderful folks at The Kitchn for mentioning my Fennel Roasted Strawberry Frozen Yogurt as part of their Delicious Links series, last week! 1. Take a large non-stick wok or large saucepan (you need a pan with large surface area to evenly brown the semolina) with a lid and heat the wok on a medium-high flame. Pour the semolina into the wok and toast the semolina until the granules just begin to turn golden brown. Stir the semolina while toasting to prevent any burning. As soon as the the semolina starts to turns golden brown remove from the wok from the stove and add the coconut oil, raisins and cardamom. Place back on the stove and cook for one 45 seconds with constant stirring. 2. Add the sugar and water, stir the contents. Cover the wok with a lid and reduce the flame to medium-low. Cook the contents for about 5 minutes or until most of the water has evaporated. Remove the lid and stir the contents, all the liquid should be completely evaporated at this point and the semolina should be soft and fluffy. Remove the wok from the stove and sprinkle the rose water over the halva. You can serve the halva as is or use a mold to shape it. Serve this halva warm, store in airtight container and refrigerate excess, reheat before serving. Note: You can also garnish the halva with toasted nuts or sweetened shredded coconut. I haven't done that here but feel free to do so if you like. In "Breakfast", "Dessert", "Halva", "Indian", "Semolina", "Vegetarian"
This past week was a lot of crazy things but it ended with a great surprise. I received an email informing me that I was included in the Top 10 Healthy Food Bloggers of 2014 by the wonderful and very kind folks at Better Homes and Garden. I won't lie, I was blown away and completely ecstatic to be included among these talented and inspiring bloggers. Though, I'm not in the running for the final awards, please do stop by their site and vote for some of the amazing food bloggers in this and other categories. I should have titled this post as "out with the milk". You see, I ran out of milk this week, no dairy or nut or any other type of milk at home for my morning oats. When it comes to eating my breakfast oats, I need something other than water in it. I usually add some milk, a dash of vanilla and a little fruit to my oatmeal but I was out of options. 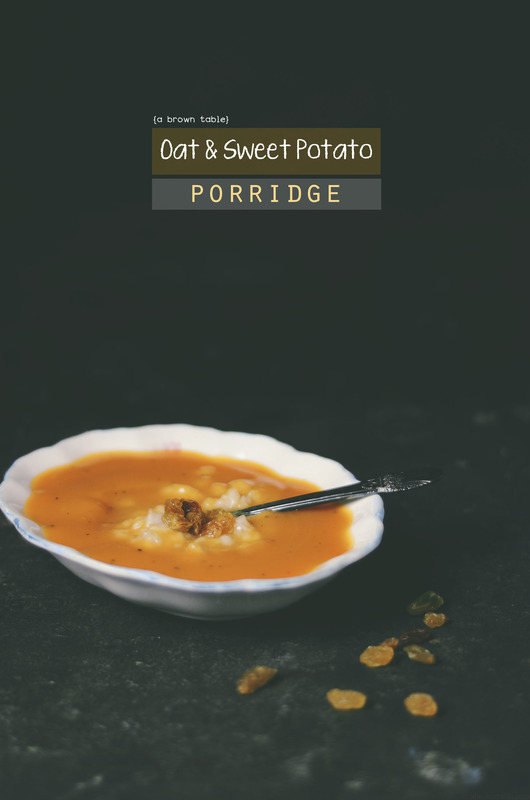 Desperation led to making a sweet potato based porridge that at first I was unsure about sharing but once I tasted it, I knew I should. Plus, I think my trainer might be pleased with this one, since she keeps asking me to increase my sweet potato intake. I flavored the sweet potato puree with freshly ground green cardamom seeds but as I've mentioned in the recipe, cinnamon works great too! So if you don't have or don't like either spice, feel free to swap or leave them out completely. If you do leave them out then I recommend increasing the vanilla extract to 1 teaspoon. 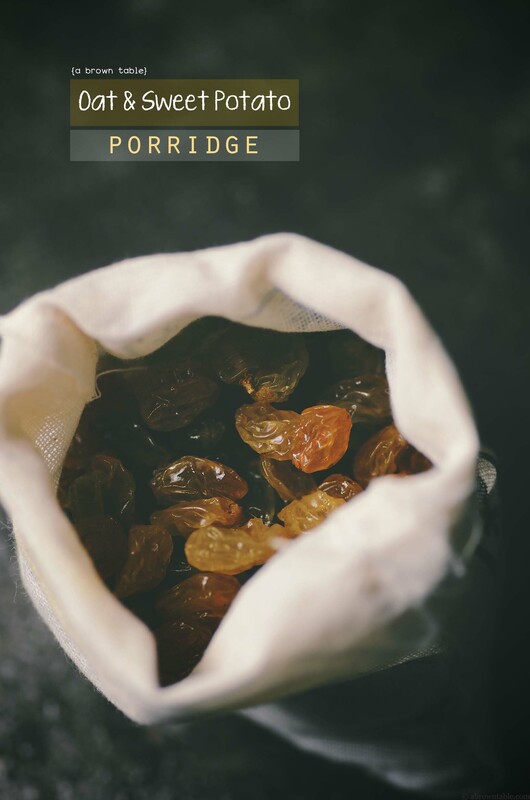 I didn't make this very sweet because personally, I am not a big fan of very sugary breakfasts but do go generous with the raisins, they provide little bursts of sweet surprises with every spoonful you taste that will make you smile. 2. 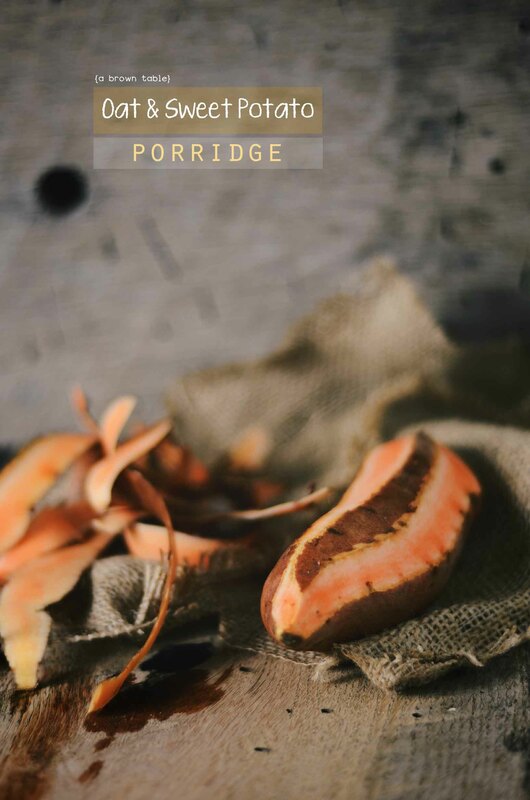 Bring the oats and remaining two cups of water in a large saucepan on a medium-high flame to a boil. Reduce the flame to a medium-low and then cook for about 20 minutes until the oats are completely soft and tender. Stir occasionally, to make sure the oats do not stick to the pan. 3. 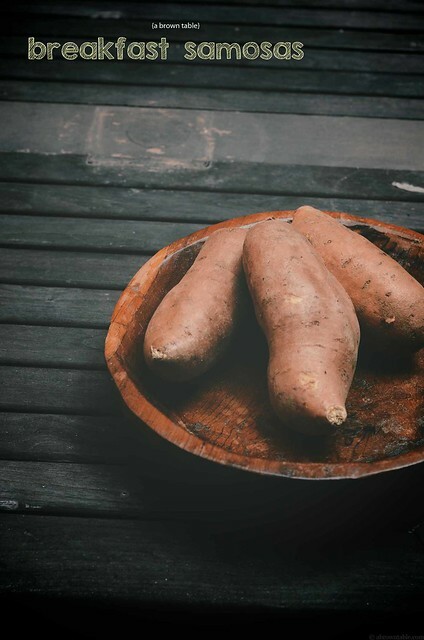 Add the cooked oats, cardamom, vanilla, salt and honey to the sweet potatoes puree in a large saucepan. Heat the contents of the saucepan on a medium-high flame until it begins to boil with constant stirring. Taste and adjust the sweetness if desired. 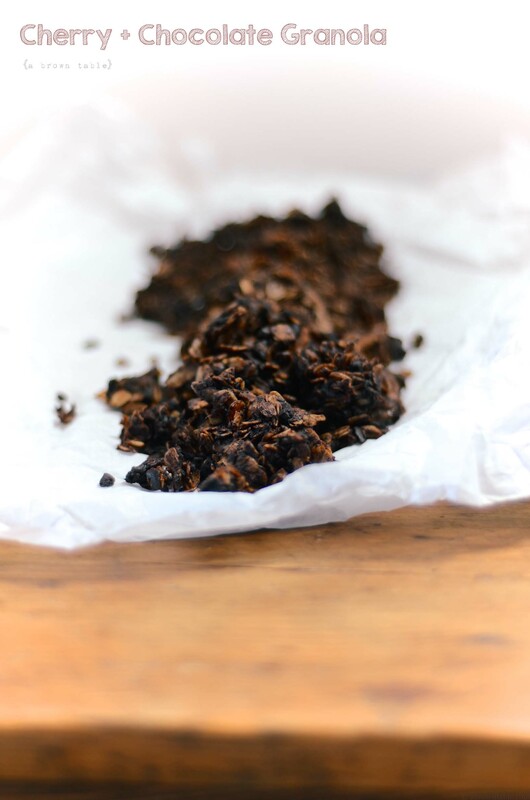 Fold in the raisins, remove from stove and serve warm. In "Breakfast", "Oatmeal", "Raisins", "Vegetarian", "oat", "porridge", "sweet potato"
Breakfast during the week was and still remains really simple for me. As a kid, it had to be quick so I wouldn't miss the school bus and now it's a moment sandwiched between the gym and work. 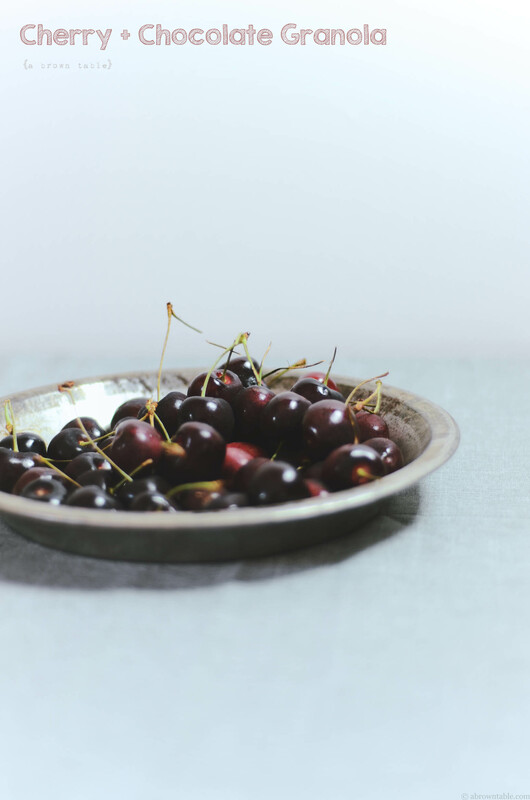 But I still keep it light and nutritious because breakfast is supposed to be one of the most important meals that sustains us through the day. I often get asked what a traditional Indian breakfast would include but the answer is not an easy one. You can have some many different options depending on which part of the country you visit, each meal reflecting the unique characteristics of that region and what is grown there. One might sweet jalebis (a fried funnel cake like pastry soaked in sugar syrup) served with milk in the North or idlis (steamed rice and lentil cakes) in the South, the options are as endless as they are diverse. You will also find eggs, like my North Indian style scrambled eggs that are spiced, cooked and served with freshly toasted slices of buttered bread. 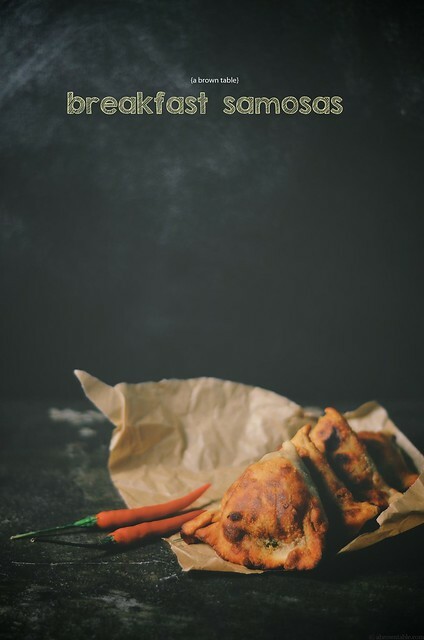 This is another one of my favorite breakfast items from the Northern region of India. Cracked wheat or daliya is similar to stone cut oatmeal in structure and shape. As the name suggests, the wheat kernels are cracked and fragmented bits of wheat. 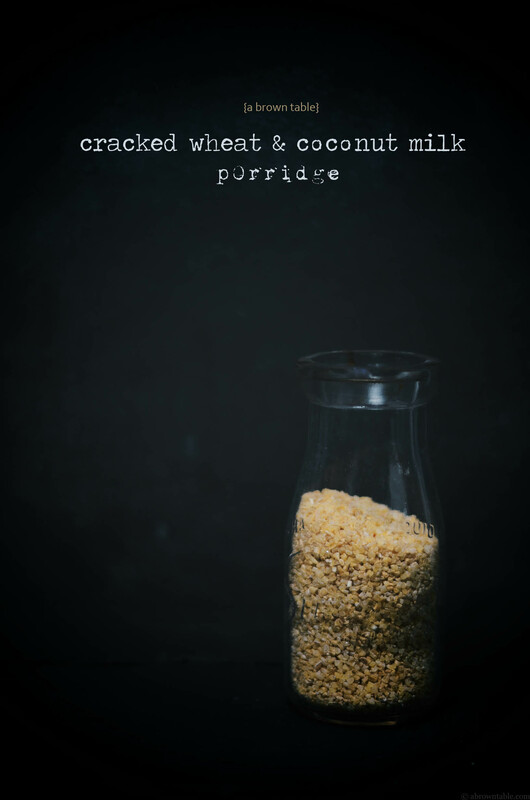 Cracked wheat is however different from bulgur, the latter being much finer and smaller in size. 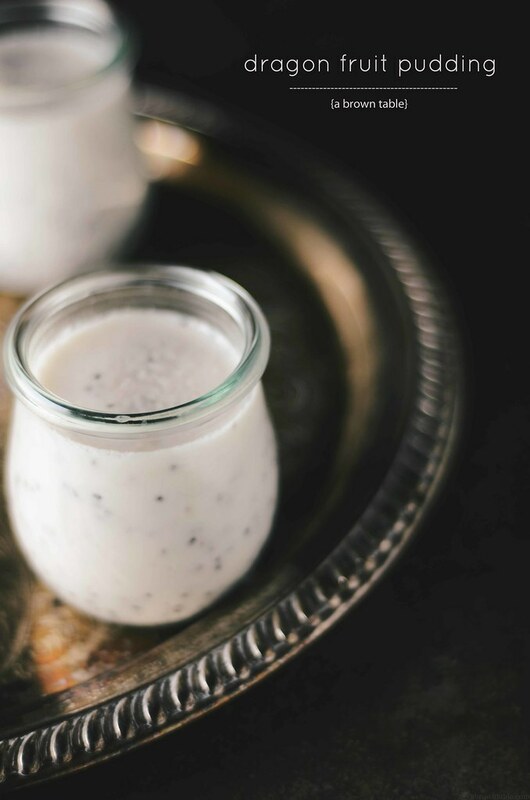 I remember large pots of the wheat kernels in paternal grandmother's kitchen being cooked with water till they were tender and then fresh whole milk would be stirred into it and lightly sweetened with sugar. Piping hot bowls of the porridge would then be served and they would be gulped down hungrily. 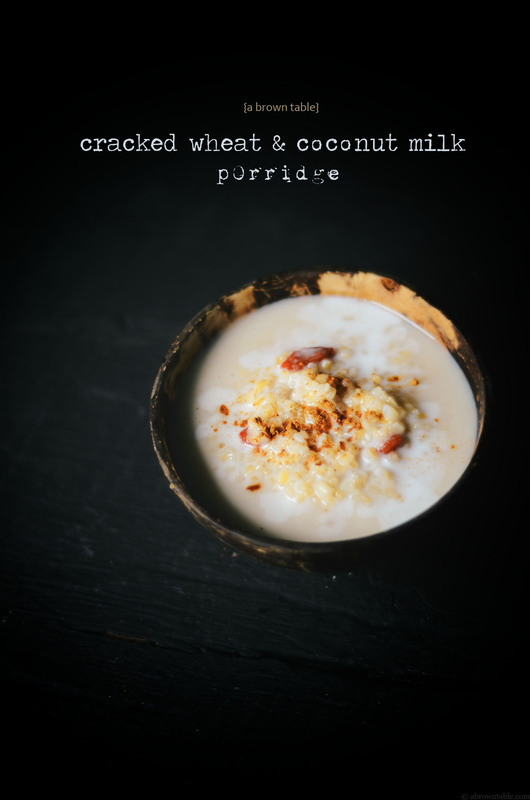 My recipe here is very different, I use lightened coconut milk to bathe the cooked wheat kernels and I flavor it with cinnamon. 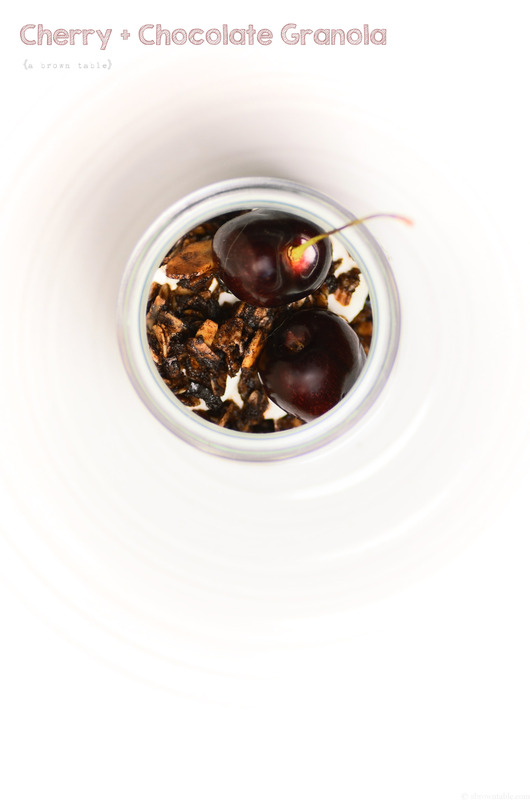 I also like to add dried goji berries but you are free to add whatever type of fruit or berry you desire. I personally prefer my porridges to be less sweet so feel free to play around with the amount of sweetener options listed in the recipe. I like the taste of both honey or brown sugar here, so you can use either depending on what you prefer. 1. Place the cracked wheat and water in a medium-sized stockpot and heat on a medium high flame. Bring the mixture to a boil and then reduce to a gentle simmer. 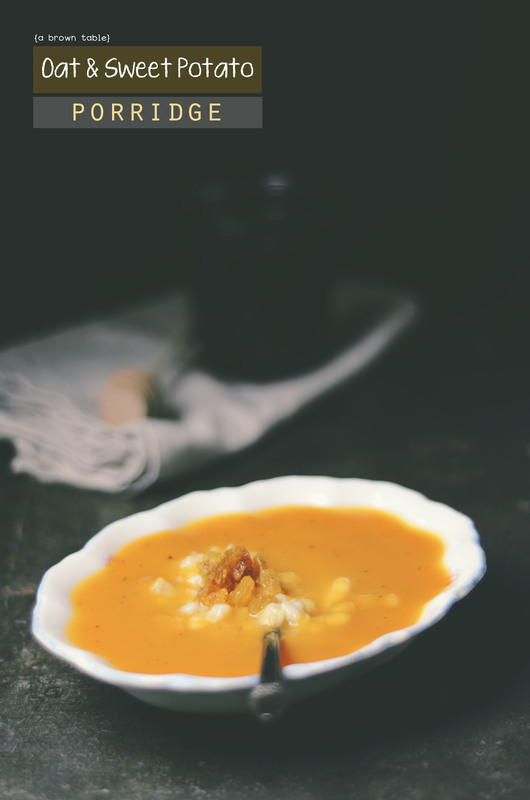 Cook for about 15-20 minutes or until the wheat kernels are completely tender. Remove the stockpot from the stove. The mixture will become slightly thick. 2. Fold the rest of the ingredients into the cooked cracked wheat kernels. Taste and adjust the sweetness if necessary. 3. Place the stockpot back on the stove and heat on medium-low flame to a gentle simmer for 2 minutes, do not allow the porridge to boil. Remove from stove and serve hot. In "Breakfast", "Cinnamon", "Vegetarian", "coconut milk", "cracked wheat", "goji berries", "porridge"
Fall's here and I'm already in the midst of planning vacations for Christmas, New Year's and the rest of winter. I've been busy drawing up lists of places I'd like to visit, restaurants I'd love to eat at and sight's I'd like to experience. A whole lot of planning that has me extremely distracted but happily excited. I never thought I'd say this but I am really looking forward to winter. This is how I have spent the past few weekend mornings looking at maps and eating this light and refreshing breakfast pudding. 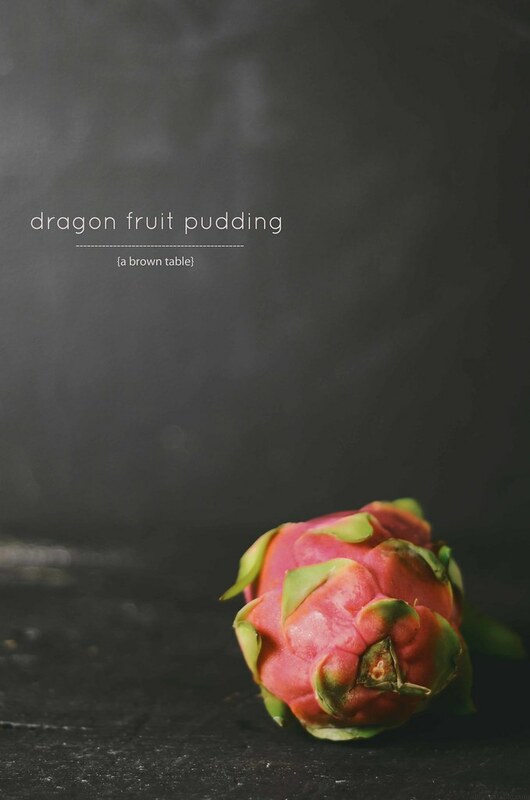 With a name like dragon you'd expect a little more of a blast in flavor but surprisingly the soft flesh of dragon fruit is mildly sweet with a fresh melon-like taste. I will give it this, if I had to imagine what a dragon egg would look like, a dragon fruit certainly has the exterior shape. 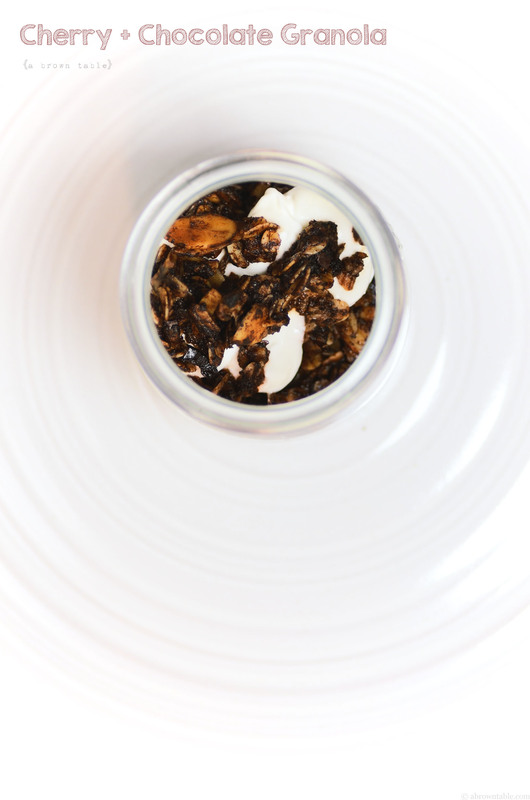 But to me, it's all about the crunch in those little black seeds of the dragon fruit. 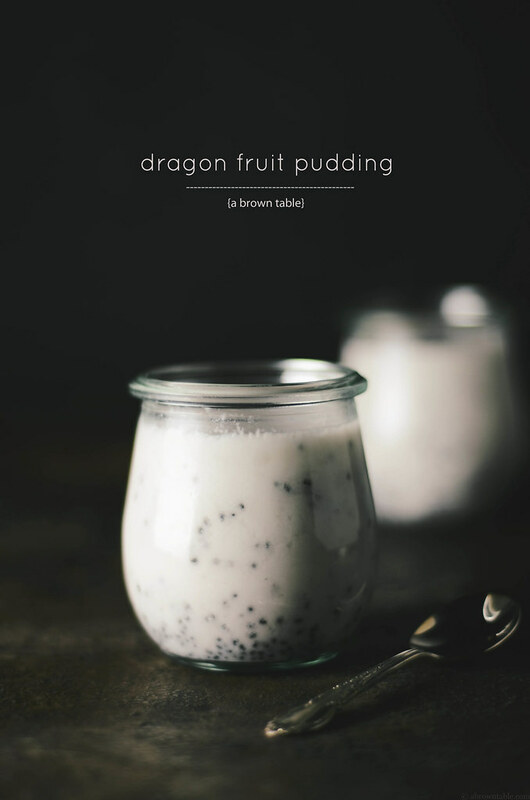 Because of its mild sweetness, I tend to prefer dragon fruit as a refreshing fruit for breakfast, another reason why I decided to prepare this breakfast-themed pudding. 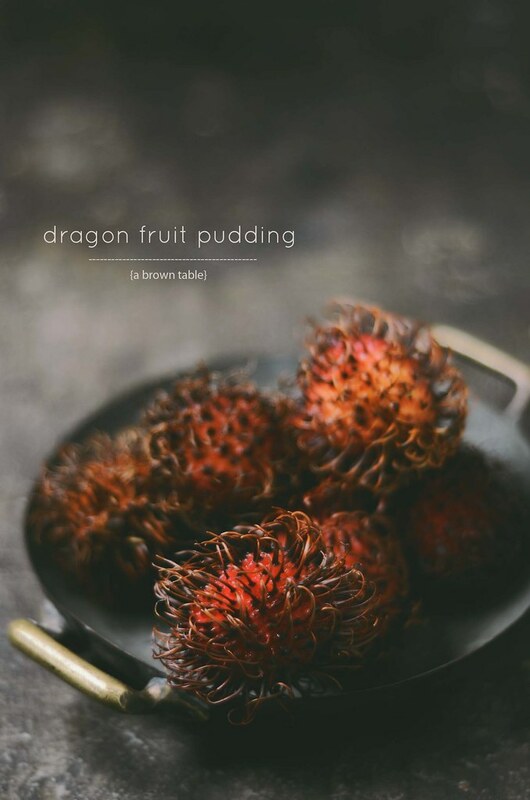 To give the pudding a little bit of a flavor boost, I've added a little bit of rambutan pulp that has a gentle floral sweet taste. 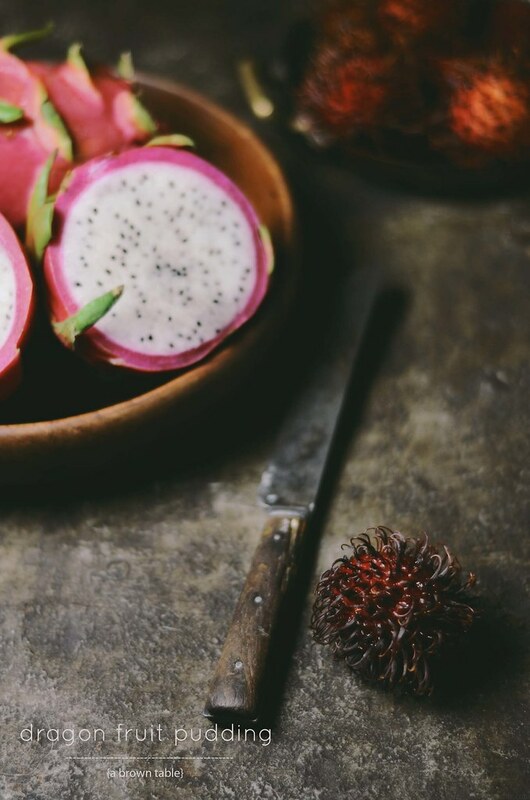 Rambutans are related to lychees and longans, once you get past peeling the skin of you are left with the sweet juicy transparent flesh that has a delightful exotic floral taste. If you can't find rambutans you can use lychees which are generally easier to find at most places. To bring everything together, I've added low-fat coconut milk and lightly sweetened it with a little brown sugar. Of course, if you prefer it sweeter, add a little more sugar. You have a couple of options here when it comes to serving the pudding, you can either pour it directly into serving dishes and allow it to set or alternatively pour it into casting molds, set and then remove before serving. Which ever way you decide to go, make sure the pudding is served chilled, the flavors are delicious when cold. Now, it's time for me to go back and plan these holidays out and eat some more of this pudding! 1. Add the water to a small bowl and sprinkle the gelatin on top. Leave aside to allow the gelatin to bloom for at least 5 minutes. The gelatin will absorb the liquid and look like swollen translucent granules. 2. 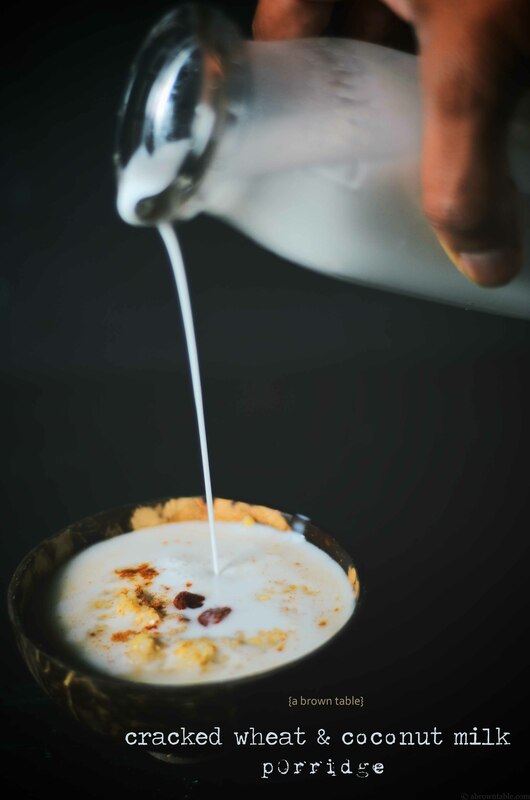 Add the sugar and coconut milk to a thick-bottomed saucepan and bring it to a gentle simmer on a medium-low flame. 3. Scoop the dragon fruit pulp into a bowl. 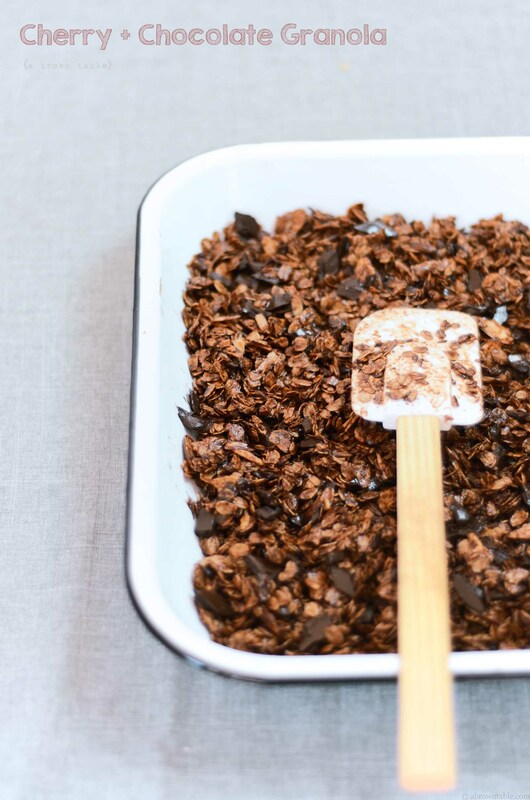 Smash the pulp with the prongs of a fork. 4. Add the dragon fruit and rambutan fruit pulps to the coconut milk in the saucepan. 5. Stir in the gelatin and mix for about 1 minute. Pour and evenly divide the liquid into serving bowls or molds and refrigerate until the pudding is soft but firm to touch. This will take at least 4 hours. Serve chilled directly in serving bowls. 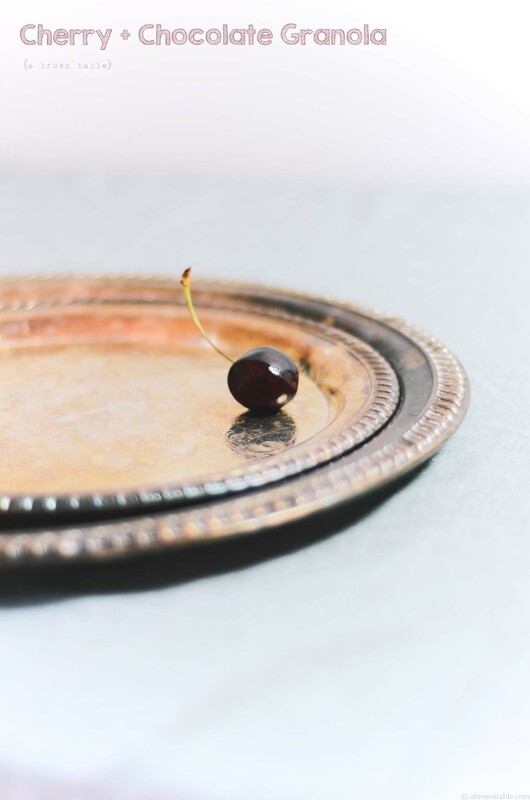 If using molds, then place the outer surface of the mold in warm water for a few seconds to loosen, flip onto a clean plate, tap gently and remove mold. In "Breakfast", "Coconut", "Dessert", "Pudding", "Sweet", "dragon fruit", "rambutans"
Last week was all about new experiences, I rescued a baby bird (it turned out to be a wren) from our sidewalk. The bird was sitting on the sidewalk, afraid and shaking. Not having the heart to let it spend the night out in the rain and potentially exposed to the dogs and cats of our neighborhood, I picked him up and brought him home. Since I could not get to the rescue facility, I kept him for a couple of days. I let him out during the day in our garden where I knew he'd be safe. Soon he came to recognize my voice and footsteps and would chirp and try to follow me around. Within a couple of days he was stronger and started to flap his wings to fly. It was time to let him back in the wild and we took him to a nearby park and left him under a bush where we knew he'd be safe. A few hours later we came back to check on him and he had made himself a little nest. I knew then that he would survive, I really hope he is flying somewhere right now. There was a moment where I'd thought I might just keep him but one pet for now is more than enough. Plus, I don't think Snoopy was too happy with the temporary shift in attention. As with new experiences, I experimented in my kitchen this week and I think I might have my new potential brunch favorite, it looks like frittata but is so very different and has its own special charm. 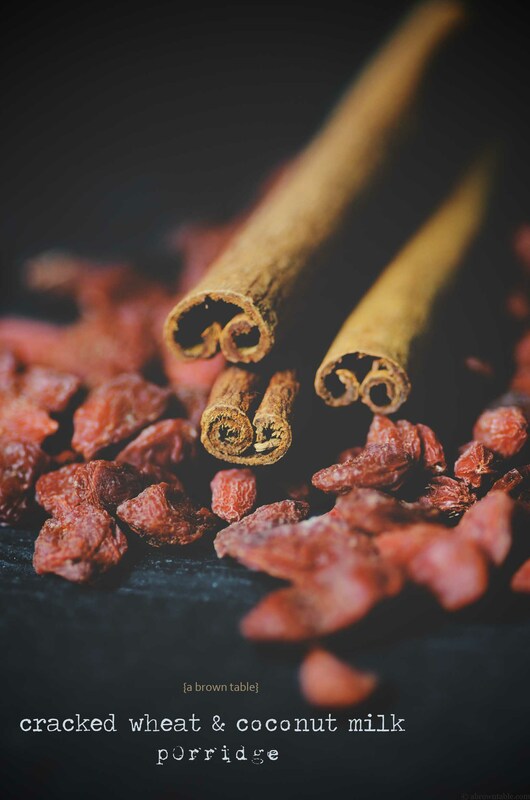 It is fragrant and colorful and can be combined with any type of vegetable or meat that you can think of. This baked egg casserole is called a kuku and goes well by itself or as an accompaniment to any meal. For this particular kuku, I used a large eggplant and some fresh herbs that we picked up at the Dupont Circle's Farmer's Market. I mention this later again in the recipe, sometimes eggplants can have a little bitter taste and you can extract the bitter flavor out by soaking the cut vegetable for a couple of minutes with some cold water and salt. Just remember to rinse the eggplant pieces in plain cold water and then wiping them dry before you cook. You can add almost any type of fresh herb to this casserole, I used dill in this particular kuku but I've also made it with fresh parsley. What makes this delicious kuku different from other stuffed egg casserole dish, is that it uses a little lime juice, flour, and baking soda. I liked the meaty texture of the eggplant with the eggs, they both somehow come together and melt when you take a bite. 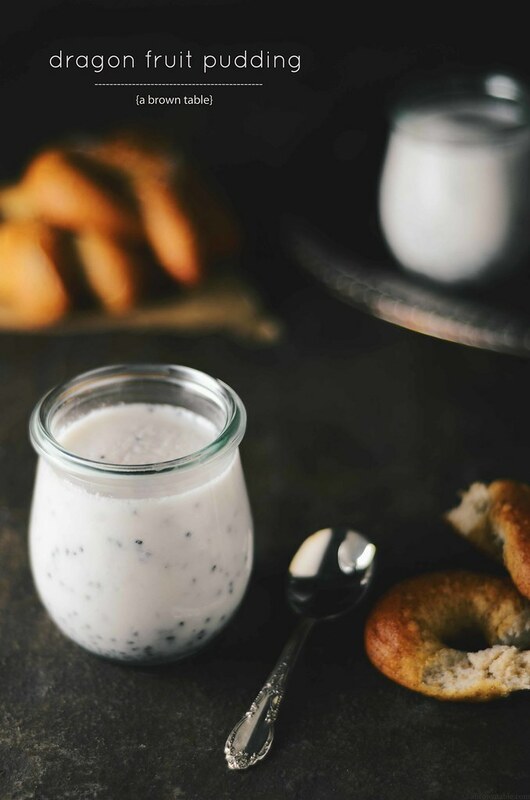 This is definitely one of my new top additions to my weekend brunch menu and I think you might want to add it to yours! I adapted this recipe from "Food of Life" by cook and author Najmeih Batmaglij. 1. Preheat the oven to 400F. Heat a 10 inch diameter cast iron skillet on a medium flame and add the olive oil. Peel the eggplant and cut out four thin slices (about 2mm thick), you will use these to garnish the kuku. Keep the eggplant slices aside. Dice the rest of the eggplant into 1/2 inch cubes and let them sit in a cold water and a little salt for 20 minutes. This helps to remove the bitterness of the eggplant. Discard the liquid (it will appear brown), rinse the chopped eggplant under running tap water. Pat them dry with a clean towel. 2. Peel and dice the onion and add it to the hot oil. Cook the onion till it gets golden brown, this should take about. Smash the garlic and peel the skin off, the finely chop the garlic and add it to the onions in the skillet and stir for 2 minutes. Add the chopped and washed eggplant to the onion and garlic mixture. Cook for another 15 minutes till the eggplant is translucent. Transfer the eggplant mix from the skillet into a bowl and let them cool for 10 minutes. 3. Crack the eggs into a large mixing bowl. Chop the dill/parsley/cilantro, the flour, baking powder, turmeric, bread crumbs, lime juice, salt, and pepper. Whisk for about a minute to mix all the ingredients. Make sure that there are no flour clumps in the mixture. Fold the cooled eggplant mix into the whisked egg batter. 4. Melt the butter in the same iron skillet on a medium flame. Remove the skillet from the gas. Make sure that the melted butter coats the surface of the pan completely. Pour the egg batter into the center of the skillet and place the four eggplant slices (that you cut and kept aside earlier) on the surface of the batter. and transfer the skillet to the heated oven and bake for 40 minutes or until the surface is golden brown and the center is cooked (test the center of the eggs with a skewer, if it comes out clean then the eggs are cooked). Remove the kuku from the oven and allow it to cool for 5 minutes before cutting and serving. It will also be easier to remove the kuku from the bottom of the skillet. Serve warm by itself or with plain rice and yogurt. In "Breakfast", "Brunch", "Eggplant", "Eggs", "Kuku", "Persian"
One cold week done and another one to board. However, the extra hour this weekend as the clock is set back by an hour will be happily received. Extra sleep is always, always good. This was a bad week of getting out here to post or much less get any time to read anything. Too much to do and too little time however, I did get to try this new recipe for a quick pumpkin bread. What started out as an attempt to bake pumpkin cookies ended up as a fast and quick way to a quick loaf of pumpkin bread. This I realize is my third pumpkin post, back-to-back. but such a delicious bread that had to be shared. I should be back to more posting this week. 1.Preheat the oven to 350F. 2. Whisk all the liquid ingredients together and keep aside. Add the raisins and the pumpkin into the liquid mixture. 3. In another bowl whisk all the dry ingredients together. Slowly add the dry ingredients to the liquid ingredients with constant whisking at a medium speed. 4. Grease a baking tin/ loaf pan with vegetable oil or an oil spray and then sprinkle with flour to coat the dish. Pour the batter into the greased dish and bake for approximately 45 minutes to 1 hour or until a knife comes out clean from the center. Allow the bread to cool in the pan for 20 minutes at room temperature, then remove the loaf from the pan and cool completely to room temperature on a wire rack. In "Bread", "Breakfast", "Dessert", "Pumpkin", "Raisins"